* Annual estimated passenger usage based on sales of tickets in stated financial year(s) which end or originate at Appleford from Office of Rail and Road statistics. Methodology may vary year on year. 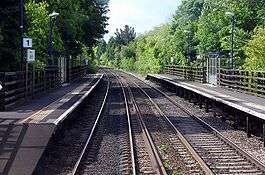 Appleford railway station serves the village of Appleford-on-Thames in Oxfordshire, England. It is about 8 miles (13 km) south of Oxford on the Cherwell Valley Line. The station and all trains serving it are operated by Great Western Railway, formerly known as First Great Western. The station entrance is on a humpback bridge and passengers must descend steep steps to the platforms. Platform 1 is served by Down Great Western Railway services towards Oxford and Platform 2 is served by Up trains towards London Paddington. South of it is the level crossing which is normally lowered with lights off. The user has to press a button for the signaller to raise barriers, then it lowers once user is clear of the crossing. The lights are only used to warn people that the barriers are coming down. It was opened originally with the line from Didcot to Oxford. The opening was 12 June 1844, having been planned and partly built by the Oxford Railway, which was absorbed into the Great Western Railway before the opening of the line. It was however closed after just a few years in February 1849. The Great Western Railway reopened the station as "Appleford Halt" on 11 September 1933 in response to growing competition from buses. The station then passed on to the Western Region of British Railways on nationalisation in 1948. British Rail discontinued its "Halt" suffix on 5 May 1969. The station was served by Network South East when Sectorisation was introduced in the 1980s. Unusually, until recently it retained the original wooden platforms and corrugated iron pagoda-roofed waiting shelters. These have been replaced by "bus shelter"-like waiting shelters. It has never been staffed; originally passengers could purchase tickets at the village Post office, however since this has closed down, passengers need to purchase tickets from the on-train conductor. Appleford station is served by stopping services run by Great Western Railway between Reading and Oxford. In total there are 16 services each way with a two-hourly interval between trains (though during peak-times the number of trains rises significantly). Most of these services start or continue as semi-fast services between Reading and London Paddington. Since the start of the Winter 2014 timetable, services no longer call at Appleford on a Sunday. Station on navigable O.S. map.